This just goes to show that all CN SUVs don't have to be Fords. 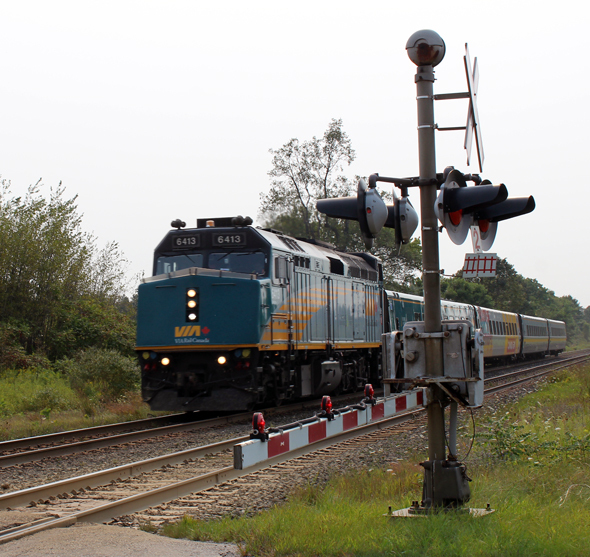 Over the years, CN has operated a large number of "Geeps" - think GP 7s, 9s, 35s, 40s, 38-2s, and 40-2s. 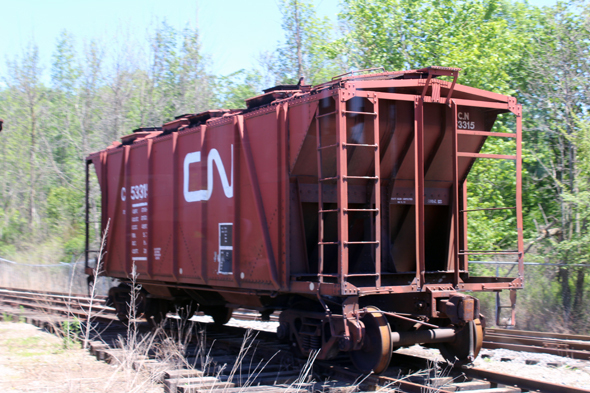 But this CN Jeep was something new to me - apparently a new acquisition policy has been established within the last year or so. 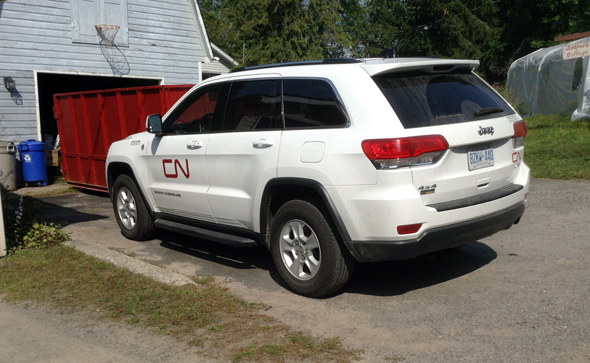 Previously I had been accustomed to seeing CN SUVs primarily of the Ford variety. 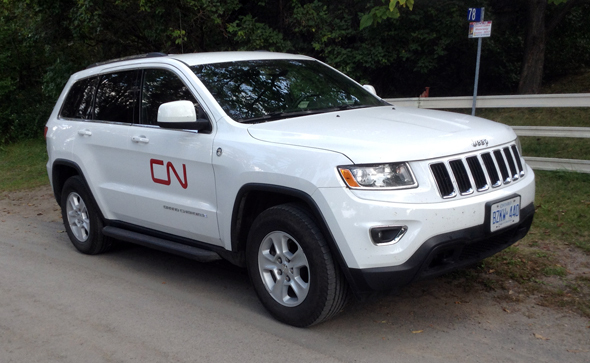 Anyway, if you are attempting to keep your CN-themed layout up to date, you might want to track down some modern Jeep models. With all the commuting they'll be doing, you'll want your division superintendents and assistants travelling in comfort and style. 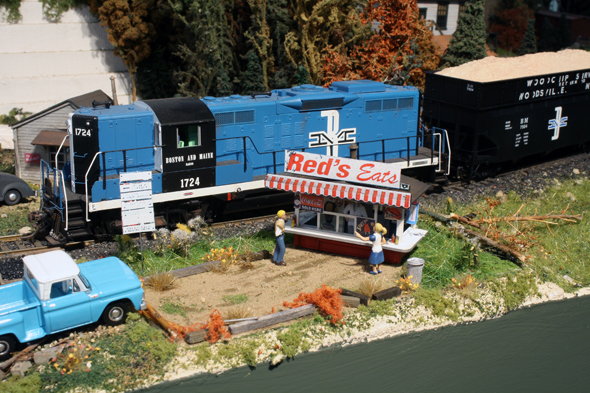 At the next train show, see if you can track down a model of one of these Jeep SUVs. 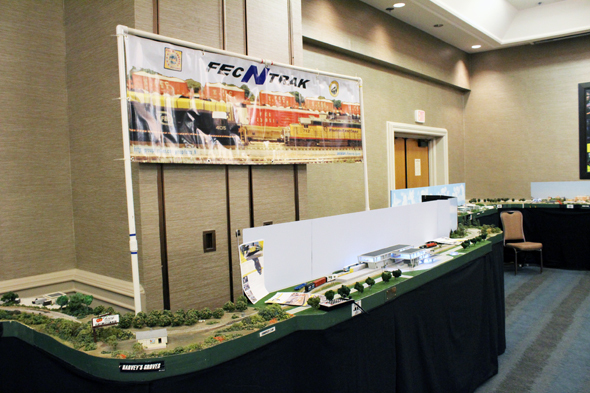 You'll want to ensure that your layout's assistant superintendent travels in comfort. 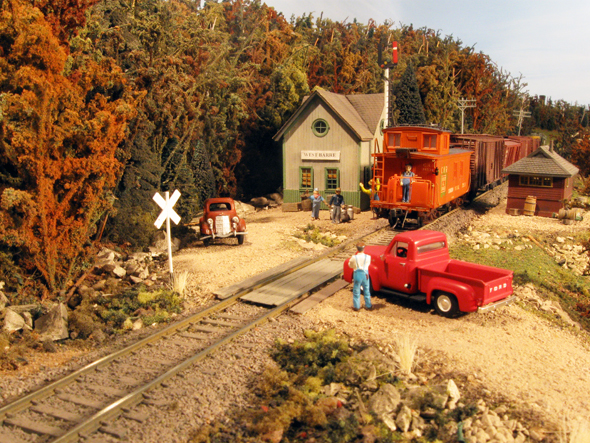 A CV freight is stopped for a moment for the crew to grab some goodies at Red's. The foreground figures are Woodland Scenic offerings I had extra. On the sign there is a loudspeaker that I also photocopied and left on. 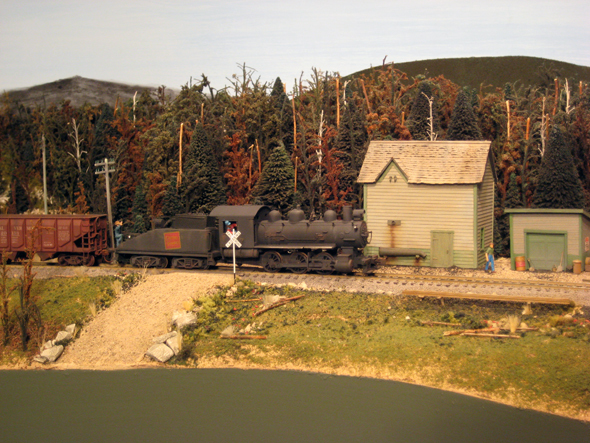 Some weeds and long static grass fill in the scene. 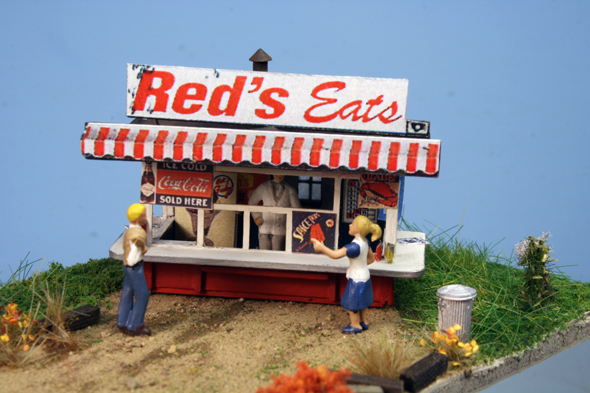 My new 1965 Oxford pickup truck is seen parked at Red's. 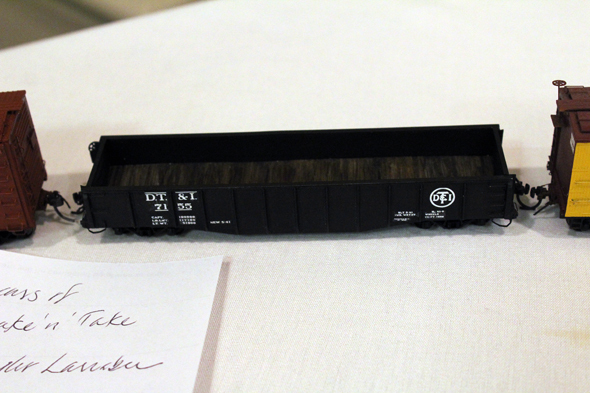 I got a deal on a four pack of Athearn woodchip cars recently so these are now in use during summer time operations. Since the back wall was going to show a little at certain angles I had to add a bit of details. 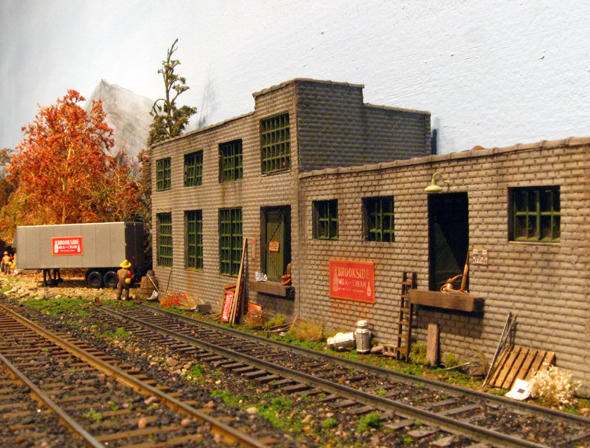 A caboose door with a bit of green is added. Leftover piece of the front awning is also placed overtop. Some signs, propane tanks and wire to a circle molding is made to look like a meter. On the roof a smoke stack is also added. The sign got some wire supports. If I knew the back would be seen I would have filled the joint...but I think it looks pretty good anyway. 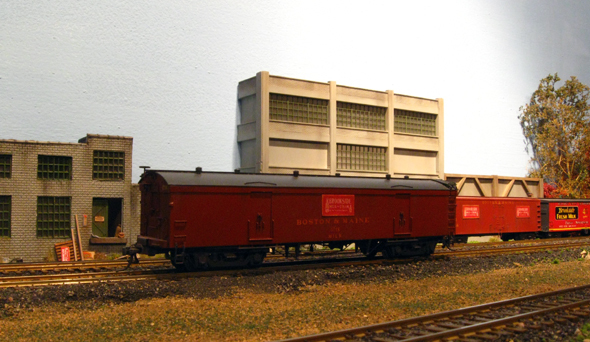 A CV through freight heads by Red's on the WRD. The era is set by the CV paint jobs and the 1965 pickup truck, an Oxford model. 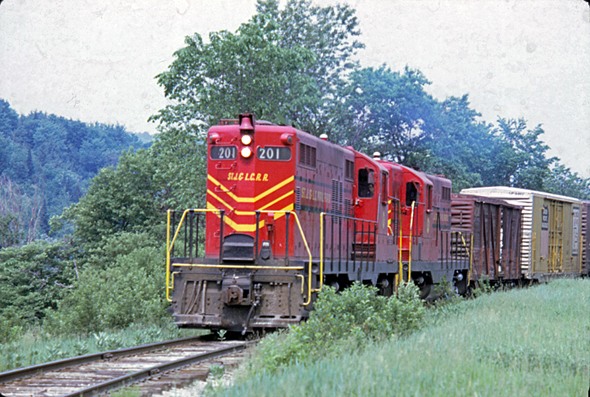 I wanted a few scenes that could be added to the layout for summer viewing when the 1960's-80's come into play. This is one for the foreground. 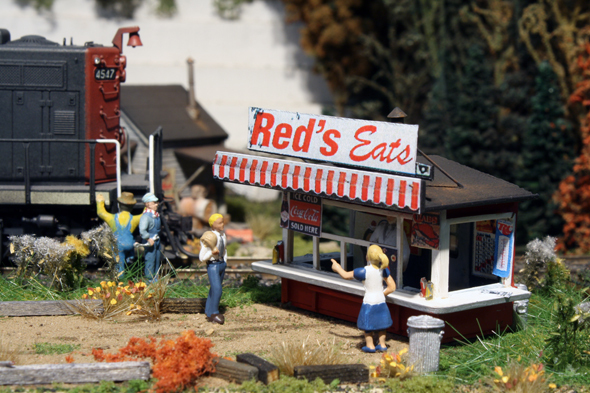 A great little place in Wisscasset, Maine which offers lobster rolls and found track side makes a great little structure to model. Back in the spring one of the booths at our local train show in Woodstock offered this little baggy of four structures for $8.00. One caught my eye as a possibility for my rendition of Red's. I do need a spot for my crews to stop and get some lunch or at least an ice cream cone. 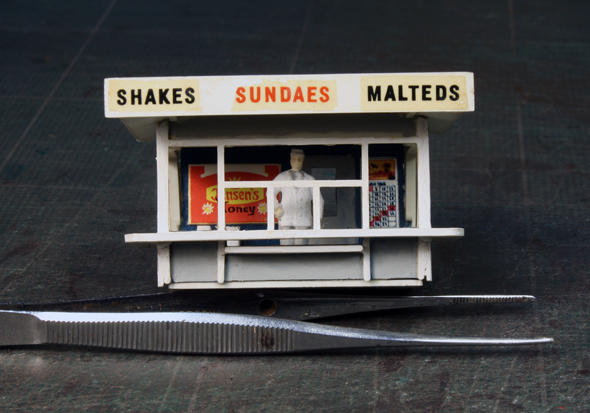 So for my later years operation this has become a new drop-in diorama. Years ago and in season while working the afternoon Ford's Talbotville switches, the job I worked normally took a transfer out to connect with the NS at Southwold yard. Once the transfer is put away we would run up to the crossing for some eats at the Polar King...a similar establishment as Red's. I normally went for a soft ice cream cone, but at times a foot long was called for. This is how Red's looked during Sept. 2016. Each time I passed by there was a lineup...even in the morning 30 minutes before it was to open. It was impossible to get a clean shot of all the signs on the structure. It sure would have been nice to add these to my model. My little baggy find that I could see Red's as a possibility. 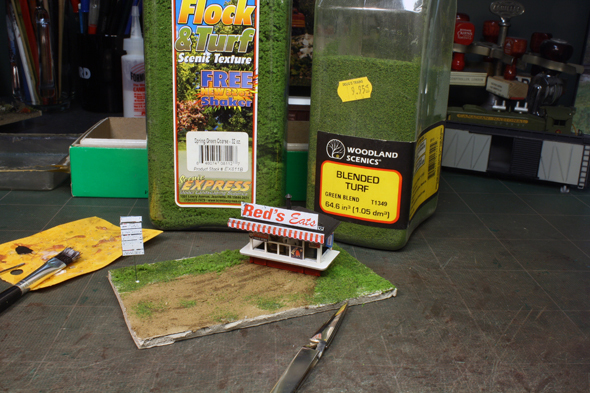 The structure is finished but the base is in the early stage of scenery. 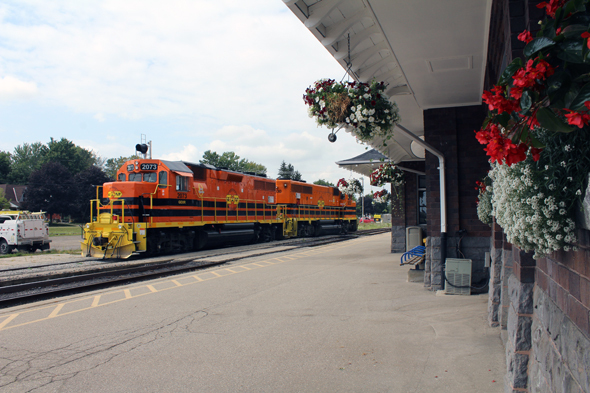 My model placed on the Railfan article that I used for the sign and awnings. I just photocopied them full size as seen in the photo. I also used the roadway sign. 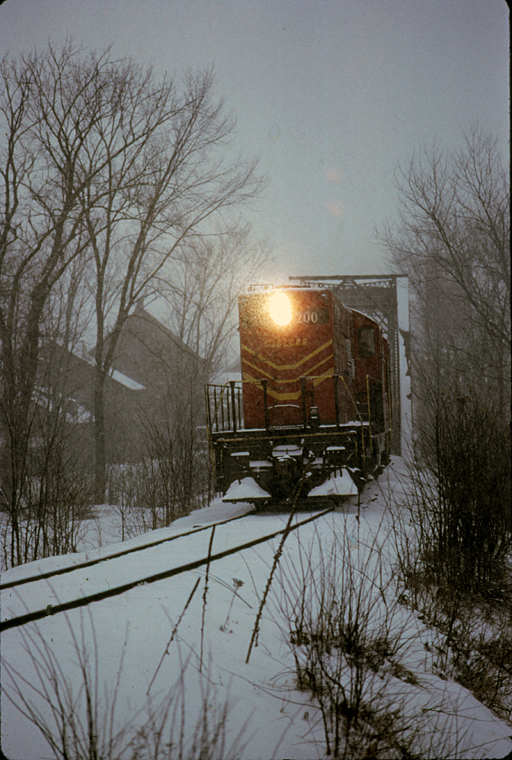 A view from the trolley. The CP car I was able to get both sides...one a lot cleaner looking than the other. 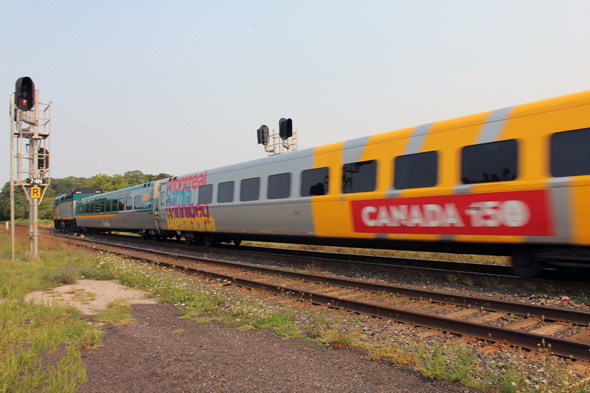 A Canada 150 coach on VIA 76. VIA 76 approaching the crossing I had just arrived at. 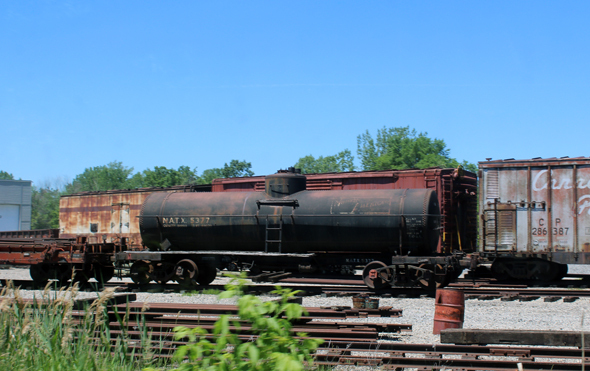 This is on my route to and from the lake...just have to keep a camera available. The CP crossing is about a half mile behind me at this point. 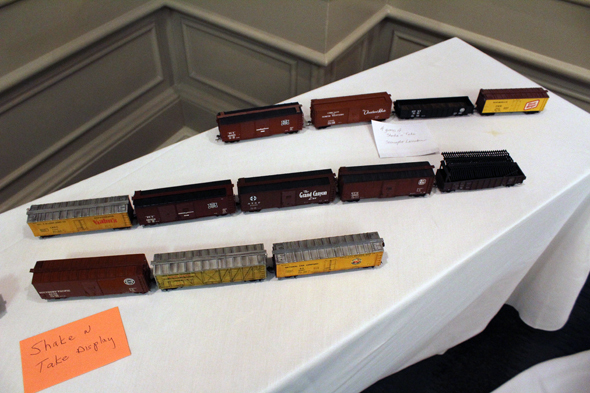 A really nice display of what has been offered at past RPM meets. A step back view of the around the wall display at Coco Beach. Lots of industrial warehouses that need to be switched. Some neat lighting is included in some of the scenes. 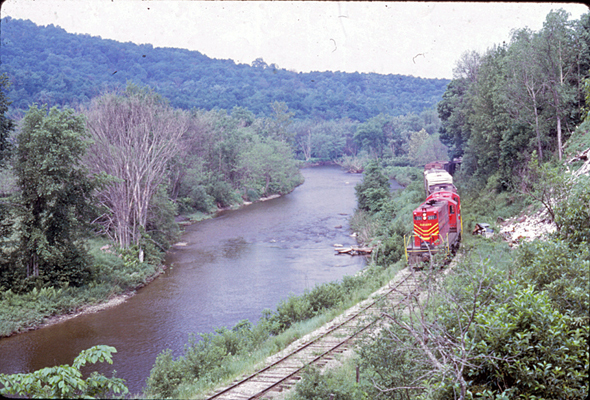 The St J turn on June 19, 1969. Busy time at the WRJ diamond. 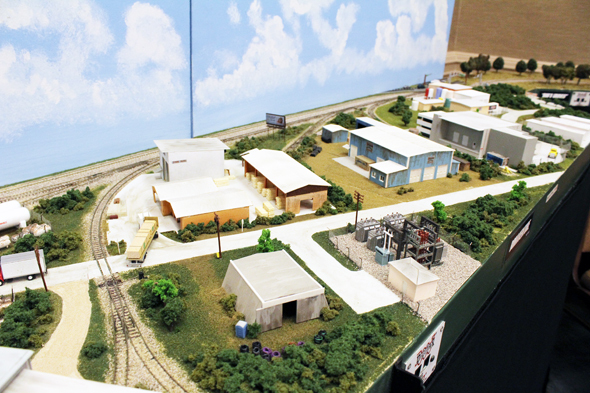 I took a group of photos this summer of what I had out on the layout at that time. My modeling season is just beginning. 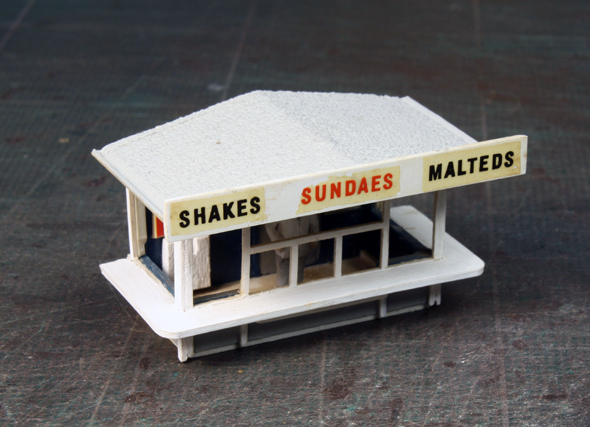 I did a small amount of modeling over the summer but nothing all that productive. 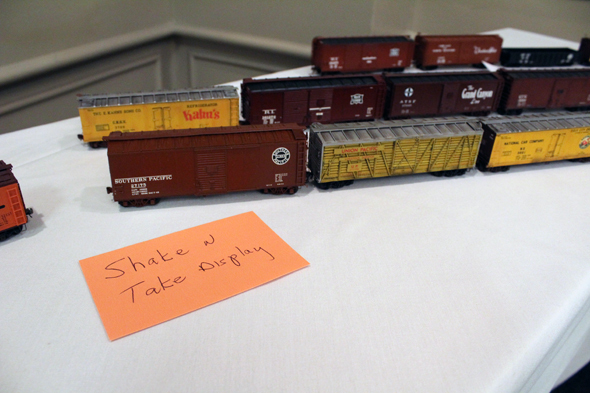 Peter and I will see if we can finish up our N scale modules this fall and we have a few pieces of rolling stock that are partly completed that we plan to finish off. No trips planned to New England yet although there are lots of modeling events going on locally that I would love to attend. I just finished the base this week. 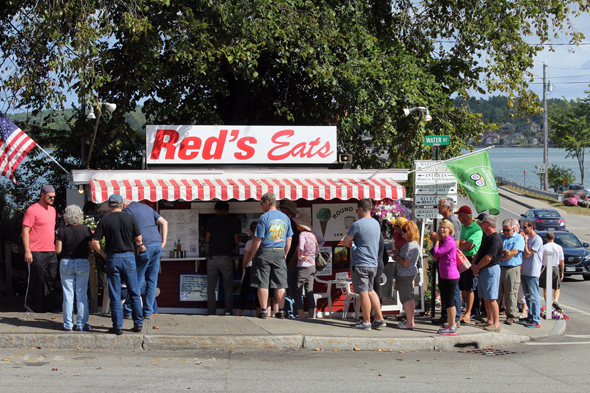 Red's is open for buisness on the WRD. It is another drop in that has been added for my later era operations. The crews need somewhere to eat...more on it shortly. August 30. 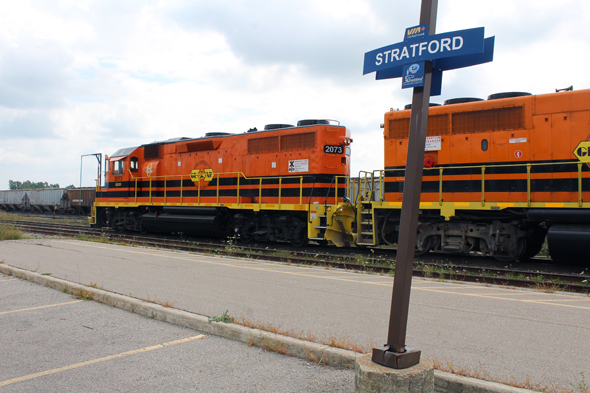 2017 I was in Stratford with my wife to take in the shops and food locations on the main street. I was able to make a side trip past the station. A GEXR power move was happening as I arrived. 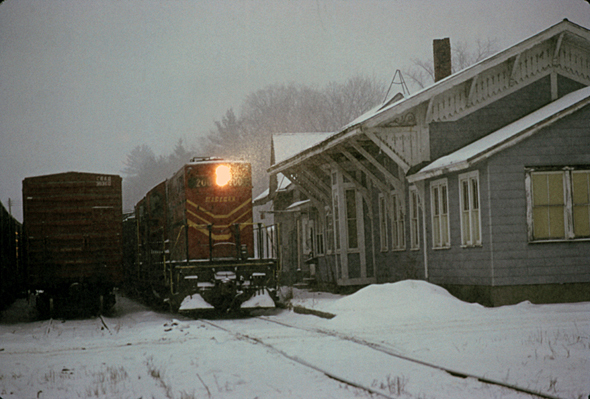 I was there long enough to see them move through the siding to a point east of the station were they appeared to be waiting for something. The power and crew are ready for something to happen but we did not stay to see what. 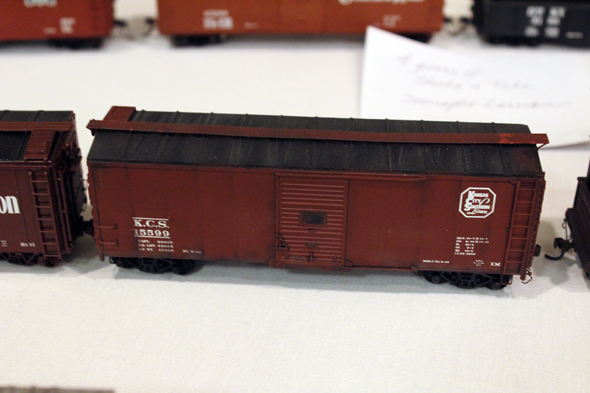 Couple more of my cabooses headed to winter storage shortly. The local has a lot to do if they want the yard cleared out in the next week or two. 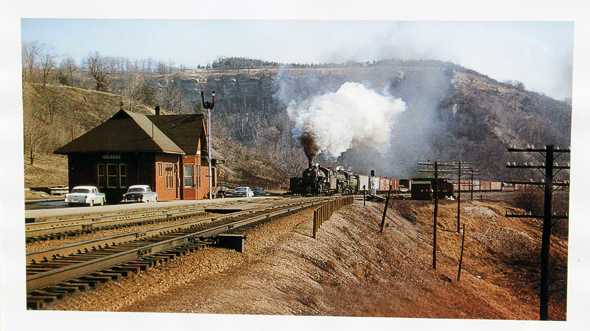 My old 0-6-0 was still running at the time Summit was in use. 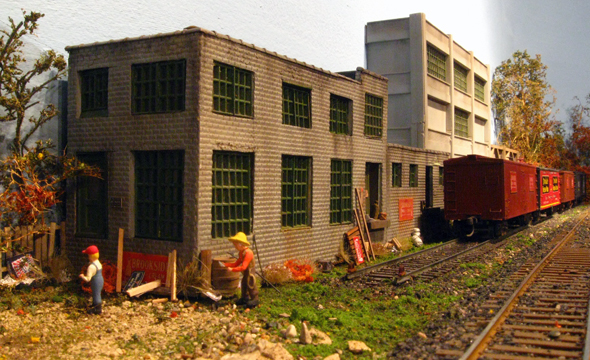 These Maine Two foot buildings were stand-in's till I constructed Crosby Coal. My Rutland Ry. 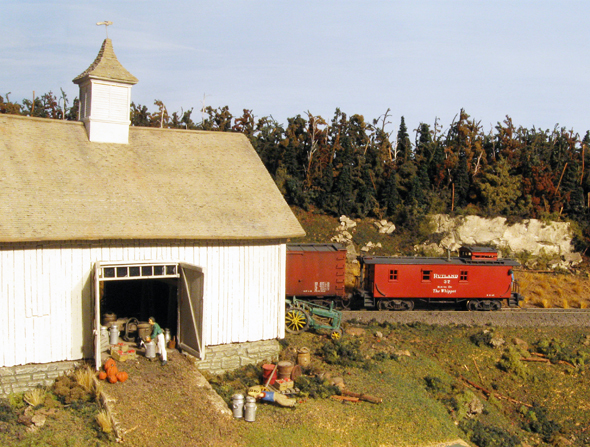 brass caboose is seen heading behind the barn and pumpkin patch. 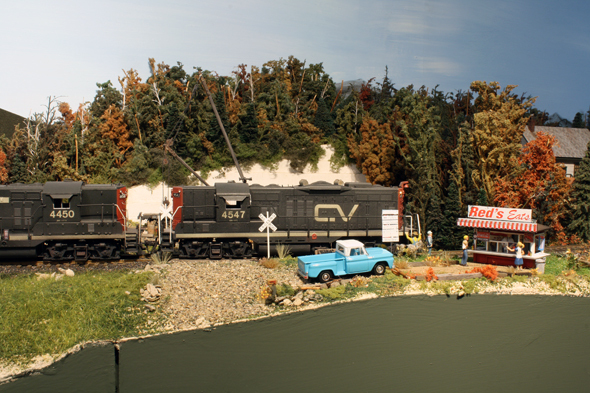 Actually one of these old views made it into RMC a couple of years ago in my pumpkin patch article while others can be found in 2008-2009 Walthers Catalog. A CV train heads into WRJ off my duck-under module. 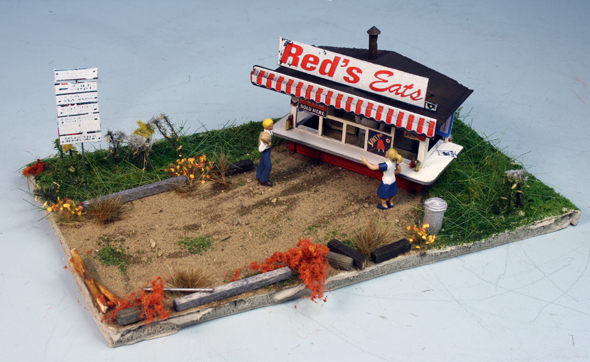 Part of the water scene was a lakefront cabin scene that really never got photographed much. 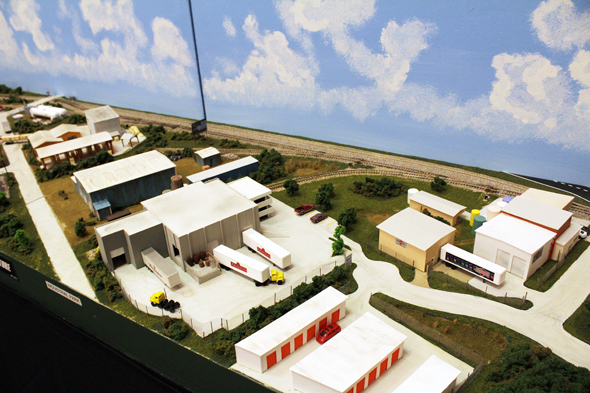 An overall view of what West Barre once looked like. 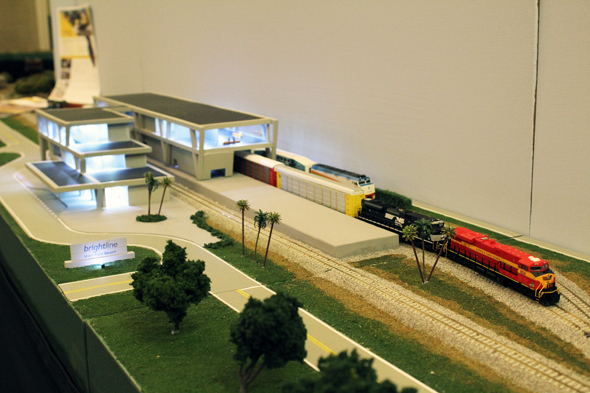 It got an upgrade followed by some newer drop in scenes before being removed so my WRJ yard could be seen and used. 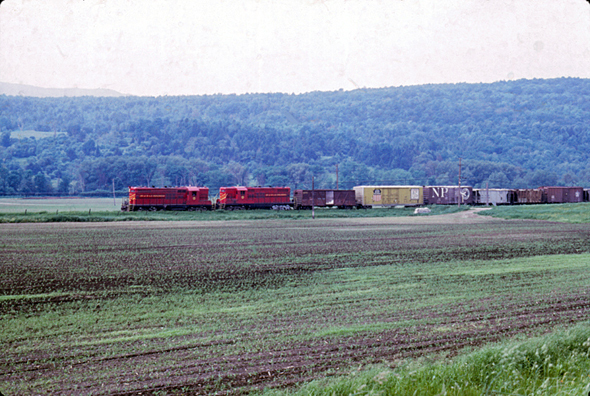 Behind the trees and station is a three track staging yard that today is in full view. 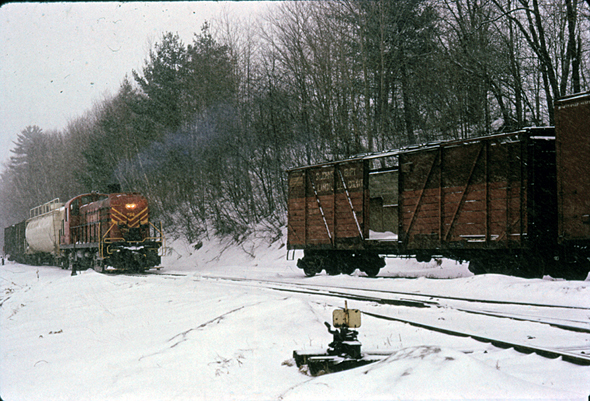 This main line track was reused as a fourth track in the yard but cut out and moved back behind the yard office. Once again looking down the track at West Barre. The engine was detailed by Don Janes. I purchased it off him years ago. 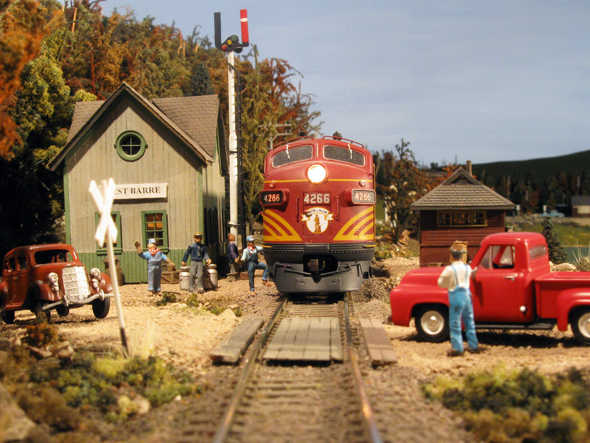 The train order signal is scratch-built and the station is an old balsa wood covered with paper siding kit that I had as a child. Somehow it made it through two sets of kids and 60 years. I added new boards, windows and roofing. Since then it got a second upgrade and looks even better now. 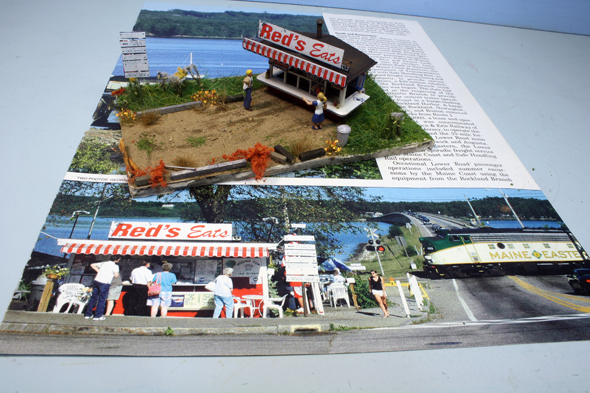 The finished creamery scene in Bellows Falls built as a building flat. I have a good fleet of milk cars that can be spotted out front. 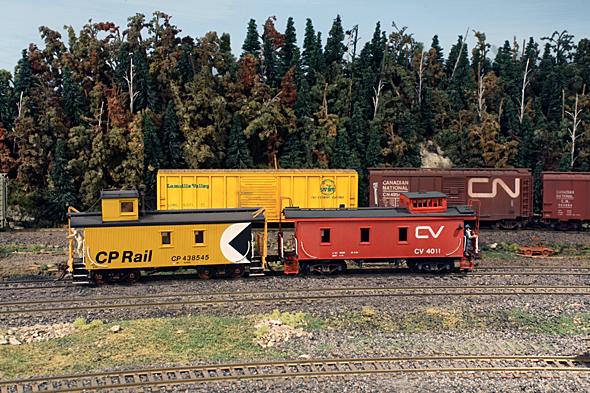 This cars are made from Walthers-Train Miniature reefers. 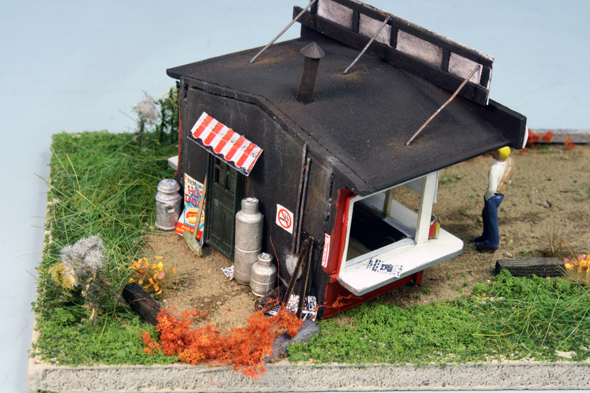 As one can see the siding and junk I normally add to my scenes is all in place. 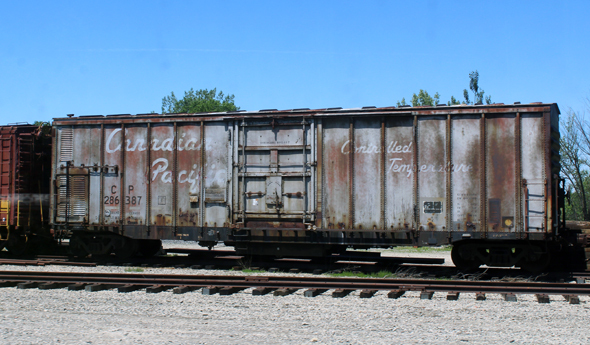 The Athearn trailer has a BF Co-Op creamery logo applied. Not sure of the colours used on the trailers but for now mine are going to be silver. This part of the structure I purchased already assembled. I did take it apart repainting it and changing out some doorways and windows. 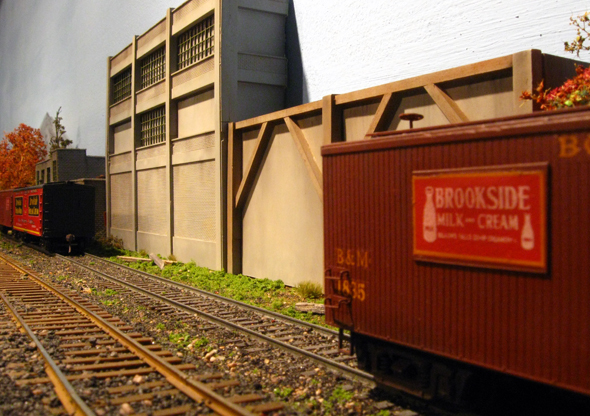 Another view of the creamery with a good string of milk cars needing loading. This location loaded milk in cases of glass bottles. The siding is code 55. This portion of the creamery is part kit-bashed, part scratch-built...all things I had on hand making this structure a really cheap build. 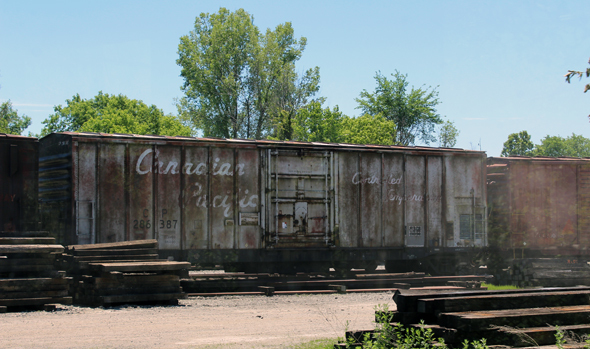 My brass milk car is on the Conn. River siding waiting to be moved to the creamery.